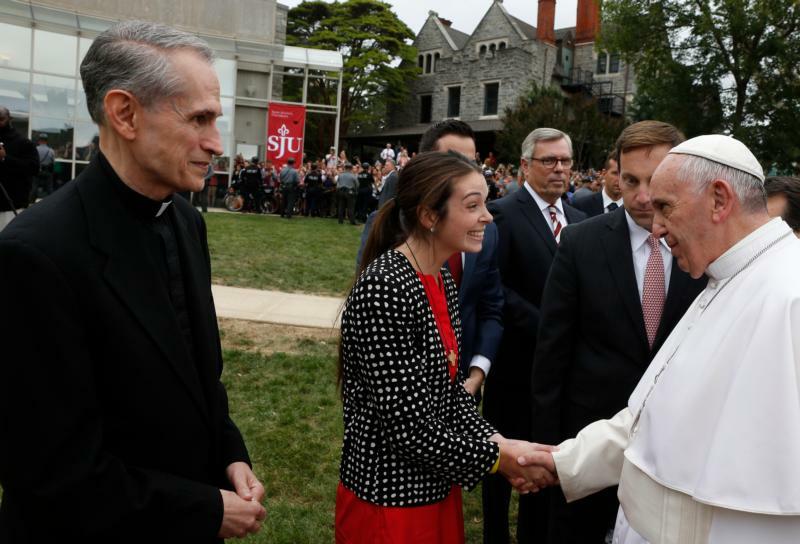 PHILADELPHIA (CNS) — Pope Francis made an unscheduled stop at Jesuit-run St. Joseph’s University Sept. 27, greeting campus officials, students and religious leaders. The pope made the visit on his way en route from St. Charles Borromeo Seminary, where he was staying, to downtown Philadelphia for the closing Mass of the World Meeting of Families. The campus is right along the road near the seminary, and the pope had passed it three times before this stop. He was greeted by hundreds of students, faculty, staff and alumni. During the afternoon stop, he blessed the newly dedicated statue on campus called “Synagoga and Ecclesia in Our Time.” The bronze work by Philadelphia artist Joshua Koffman commemorates the 50th anniversary of “Nostra Aetate,” the Second Vatican Council Declaration on the Relationship of the Church to Non-Christian Religions. St. Joseph’s, one of 28 Jesuit colleges and universities, was the first U.S. institute of higher education to establish an institute for Jewish-Catholic relations, in 1967. “Since his election, the Holy Father has inspired us in so many ways,” said St. Joseph’s President Mark Reed. “His ministry and leadership style have been a topic of discussion and an example in our classrooms. He has re-energized and strengthened our student body in their Catholic faith. And he has reminded all of us of the power of humility and compassion. Reed was joined by other members of the St. Joseph’s community, including Philip Cunningham, professor of theology and director of the university’s Institute for Jewish-Catholic Relations, and Rabbi Abraham Skorka of Buenos Aires, Argentina, a longtime friend of Pope Francis and co-author with him of a best-selling book about their interfaith dialogue. Pope Francis also visited the sick, elderly and infirm Jesuit priests and brothers at the Jesuit infirmary at the school, according to a tweet by Jesuit Father James Martin, culture editor of America magazine.